SOUTHINGTON - It took 20 matches, but the Southington girls volleyball team finally met its match. After finishing its regular season 18-0, Southington’s next step was the CCC Tournament and the Blue Knights did not disappoint in the first round, sweeping Hall on Monday. But Tuesday night was different. The top-seeded Blue Knights fell to No. 8 Farmington (14-5) 3-2, dropping the final three sets 25-16, 26-25 and 15-10 at Southington High School. After coming out on top in the highly-contested first two sets, 25-22 and 25-18, Southington again found itself in another back-and-forth battle in the third, one that the Indians used to turn the momentum of the match in their favor. Early on, both teams used short runs to try and gain an advantage. Southington and Farmington tied the set numerous times, but it wasn’t until the Indians used a 9-2 run to pull ahead (15-8). The Indians continued to rally with a 6-1 run to increase the score, 22-15. Farmington ended the set on top, 25-16. From that point on, the Indians took control despite the Blue Knights having numerous opportunities to put the match away. Farmington jumped out to a 5-0 lead to begin the fourth set and held a steady lead early on. But the Blue Knights were again able to mount a comeback, using a run of six to get them within one at 9-10. But the Indians kept their lead and were able to expand it to 14-10. Southington utilized a couple short runs and a run of five to give itself its first lead of the game, 19-18, only to drop the set 28-26. In the deciding game, the Blue Knights were finally able to jump out to an early advantage, something they were unable to do in the first four. Southington took a 3-0 lead in the fifth, but that lead was quickly lost. Farmington used short runs of two’s and three’s to get back out in front. The two teams would tie twice, 5-5 and 6-6 before the Indians dictated the set. Farmington went on and finished the set 15-10, ending the Blue Knights’ 19-game win streak in the process. The first two sets were close as well, only those went in the Blue Knights’ favor. Down 17-13 in the first set, Heitz pulled his team in for a timeout to regain its focus. Whatever the head coach said, worked. Southington rallied for a run of four to tie the game at 17-17. Nearing the end of the set, it was a battle of who could get the points first. It was the Blue Knights, 25-22. The second set was just as tough as the first, but Southington able to hold at least a one-point advantage throughout the set. The Blue Knights added insurance with a run of six for a 16-8 lead. The Indians tried to battle back with a 7-2 run of their own, but it wouldn’t be enough. The Blue Knights finished the set 25-18. 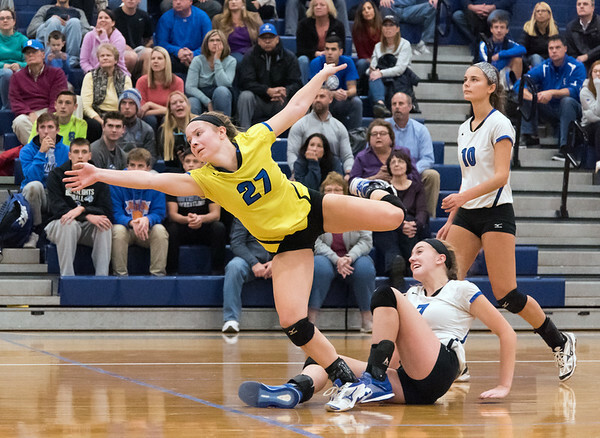 Olivia Carpenter (43 assists, 5 digs), Brooke Cooney (15 kills, 17 digs) and Lynsey Danko (30 digs) were some of the other top performers for Southington, which will now wait to see who its opponent will be in the Class LL tournament. Posted in New Britain Herald, Southington on Tuesday, 30 October 2018 21:14. Updated: Tuesday, 30 October 2018 21:17.